Objectives: The aim was to design frameworks and develop a detailed process regarding Hospital-Based Health Technology Assessment (HB-HTA) in South Korea. Methods: We conducted a literature review and interviewed in writing or in person experts to assess the need for and existing types of HB-HTA. Results: HB-HTA in advanced countries can be classified into four types according to the condition of hospitals and type of assessment. Further, the expert interviews revealed the necessity of HB-HTA for the efficient introduction of new health technologies and financial cost reduction in hospitals. Finally, three ideal HB-HTA models for use in South Korea were suggested as part of the identified framework: an education and dissemination model, a governmenthospital joint research model, and a self-research model. Conclusions: The suggested three models will contribute to the provision of safe, effective, and cost-effective health technologies and efficient resources allocation in hospitals. Hospital-based health technology assessment, Framework design, Education dissemination, Government–hospital joint research, Self-research. One of the main purposes of conducting a health technology assessment (HTA) is to provide decision makers, patients, related researchers (e.g., in the areas of health policy, HTA, or health technology development), and reimbursement payers with information about the economic, organizational, social, and ethical impacts of specific health technologies, as well as obtaining clinical evidence and economic analysis . For these reasons, many countries have established independently operated agencies to produce scientific evidence regarding health care policies and to provide solutions for general healthcare services at a national level . Although HTA has been developed to meet governmental needs, advancements in healthcare systems have raised worldwide the necessity of progressive decentralization because the results of HTA conducted by central agencies are frequently irrelevant to hospital issues, and sometimes inappropriate for local-level decision making. Furthermore, it has been found that the produced policy recommendations rarely reflect local priorities and local values . Therefore, a hospital-based HTA (HB-HTA) program was introduced in the mid-1990s to support decision making in the medical institutes of advanced countries, e.g., large hospitals, where health technologies could be applied directly to patients. According to the Experience of Gemeli University HTA Unit, objective of HB-HTA is to resolve the increasing financial issues that arise when newly developed technologies are to be introduced at those hospitals. In addition, HB-HTA has been used to support decision making for hospital management by providing scientific evidence regarding the safety, effectiveness, cost effectiveness, and organizational, ethical, and legal impacts of the newly developed health technologies, and to provide policy recommendations to related government decision makers or insurers . For these objectives, HB-HTA has been actively implemented recently in Canada, Italy, Spain, France, and other European countries [2–7]. Further, the European Union recently funded the Adopting Hospital-based HTA (AdHopHTA) project, which has four aims: to perform a critical analysis of established HB-HTA initiatives in Europe, to provide an empirically founded set of principles for best practice in HB-HTA, to advance a framework for HB-HTA initiatives and facilitation in Europe, and to promote cooperation and coordination between HB-HTA initiatives and national/ regional HTA agencies. The AdHopHTA’s intermediate results show the efficiency of introducing innovative health technologies, diversity of application of information, and expandability of collaboration between hospital and national/regional HTA agencies . However, in South Korea, HTA is being conducted for just two reasons at the national level: decision making regarding insurance coverage and researching existing health technologies. The former case, which is focused on verifying the safety and effectiveness of newly developed medical procedures, has been conducted by the committee for new Health Technology Assessment (nHTA) under the Ministry of Health and Welfare, with support from the national HTA agency: the National Evidencebased Healthcare Collaboration Agency (NECA) . An nHTA usually involves a systematic review and has the legal authority to analyze and assess the safety and effectiveness of a newly developed technology. Research regarding existing health technologies has been conducted by NECA for its currently listed medical procedures, drugs, and devices, and the focus of this aim of HTA is on safety, effectiveness, and cost effectiveness . However, the concept of HTA has just spread to some healthcare professionals at major university hospitals in South Korea. Furthermore, at present, few hospitals are conducting HTA to verify health technologies or the associated systems in order to resolve financial and management issues. Although the introduction of an HB-HTA system in South Korea may promote safe and effective medical service delivery to patients as well as the effective use of hospital financial resources, at present, no research has looked at the introduction of HB-HTA in South Korea. In this paper, we investigated practical cases of HB-HTA in advanced countries and determined the demands for HB-HTA in South Korea by interviewing experts in medical institutions and health policy decision-making organizations. Our aim was to develop a plan for introducing HB-HTA in phases and to provide detailed frameworks of the models that could be used to do so. HB-HTA examples in advanced countries In order to examine the HB-HTA in advanced countries, a literature review was performed according to the process displayed in (Figure 1). Ovid-Embase (1980 to April 3, 2015) and Ovid-Medline (1946 to present) databases were searched on April 5, 2015 using search terms (“HTA.mp” OR “health technology assessment.mp”) AND (“EXP hospital.mp” OR “hospital.mp” OR “hospital based.mp” OR “HB.mp”). Searches were limited to English language publications and after duplicates were removed, 586 unique articles were identified. Articles were retained if they focused on practical cases of HB-HTA, including the introduction purpose and role of HB-HTA, composition of the HB-HTA organization and expert committee in hospitals, and the HB-HTA process and operation method. Titles and abstracts were read by one author and irrelevant records excluded, and the full text of nine articles was also read. Finally, 47 articles were selected for review. To determine the detailed needs of HB-HTA, we conducted interviews with experts, using content created by the three authors of this paper. Interviewees were decision makers from the Ministry of Health and Welfare, and health professionals, including clinicians and HTA specialists, who were well acquainted with HTA in South Korea. The 1-hour interviews were conducted at each respondent’s workplace, in person or in writing, based on the same detailed questions. In the interview, we first explored participants’ recognition of HB-HTA and asked questions about their perceptions regarding the necessity and urgency of the introduction of HB-HTA in South Korea. Then, the following questions related to the application of HB-HTA in the clinical field were asked: most applicable scale of hospital, most necessary health technology area, main element of assessment, and ideal composition of the HB-HTA unit. On the basis of the expert interviews as well as a comparison analysis of practical cases in other countries from the literature review, we developed frameworks for HB-HTA, taking into consideration the South Korean situation. The frameworks comprised three models-the education and dissemination model, the government–hospital joint research model, and the self-research model-with varying purposes and phases of introduction. Then, we developed a detailed introduction plan. According to the HB-HTA World-Wide Survey conducted by the HTAi HB-HTA interest sub-group, HB-HTA can be classified into four types by organizational complexity and focus of action. Most common is the HTA unit model, in which HTA units are formal organizational structures that employ HTA specialists on a full-time basis and, as a result, usually produce high-quality assessment reports. Most hospitals that implement HTA have adopted the HTA unit model. The HTA unit is usually located in the university hospital and sometimes in a local community region, and has a good relationship with several university hospitals. In addition, over 80% of HTA units consist of interdisciplinary groups within hospitals, including full-time or part-time professionals. The role of HTA units is not only to implement HTA regarding medical devices, diagnostic tests, and medical services, but also to undertake intramural research and development (R&D) and relative training. The units also issue a newsletter to disseminate their result reports in some cases. Most HTA units are supervised and managed by HTA executive committees. This kind of HTA unit is established in Canada and Italy and, to a lesser extent, in America and Sweden [4,11]. The Internal Committee Model is used by the hospital committee to implement HTA. An internal committee produces evidence and, on this basis, the committee proposes policy advice to the hospital management and local community. The committee consists of representatives from the management, finance, clinical, and medical services departments, and conducts HTA, training, and research. This model is used in hospitals in Spain, Australia, and Canada, including the Health Technology Assessment Committee of the Greater Victoria Hospital Society and University of Alberta Hospitals in Canada. However, many hospitals have adopted the HTA unit and Internal Committee compound model . Third is the mini-HTA model. One or a few professionals collect data and conduct HTA using a formal checklist format, including 20-30 questions related to the four perspectives of technology, patients, organization, and economy, as they pertain to the adoption of newly developed health technologies. On the basis of the results, 2-5 page reports are produced, which are used as part of the management’s decision making regarding the adoption of newly developed health technologies or specified changes regarding the use of existing health technology. The mini-HTA is actively being applied in Denmark, where the National Board of Health uses this tool cross-nationally when hospitals apply for permission to undertake newly developed medical procedures. However, according to Denmark’s research results , the quality of the information in those mini-HTA reports is insufficient for decision making because there are no quantitative estimates of effect size. For this reason, the quality of the reports needs to be improved by professionals through the elimination of inaccurate information [11,12]. Last is the ambassador model, which involves clinicians who are recognized as opinion leaders acting as ambassadors of the HTA message within the hospital. Although they do not take part in the HTA directly, they contribute to the diffusion of published HTA results at the hospital level. The major diffusion elements are safety and effectiveness as well as the financial, organizational, and policy impacts of the applied health technology. The additional elements are ethical, legal, and public impacts as well as differences in comparative technologies, and so forth [11,13] (Figure 1). The McGill University Health Centre (MUHC), in Quebec, Canada, consists of a complex of five university teaching hospitals with approximately 1,200 beds. The main purpose for the Technology Assessment Unit (TAU) of the MUHC is managing the pressure from the increasing amount of innovative health technologies compared with the limited financial resources, because innovative health technologies are paid from existing funds. Further, over the past few decades, there have been considerable cuts to the hospitals’ funds; thus, the role of the HB-HTA unit is to support hospital administration in managing regional issues through implementing transparent, fair, and consistent systems. The unit comprises healthcare professionals and a policy committee representing the hospital community. The HTA process is as follows: First, there an application for HTA is submitted by a member of the MUHC community. Second, the topics are chosen for the candidates of the HB-HTA, which can be a difficult decisionmaking process due to high costs or uncertain clinical benefits; thus, they are usually prioritized according to their urgency and feasibility. The primary objective of these requests is to provide timely policy advice to hospital administration on specific health technology acquisition issues. To avoid duplication of technology assessments by other agencies, the TAU searches ongoing or completed HTAs before a new project is initiated. Third, a draft document is created through the analysis of financial, patient, ethical, and policy impacts in collaboration and consultation with healthcare professionals, which the policy committee uses to develop policy recommendations consistent with community values. Fourth, the draft is reviewed and modified, if required, by an executive committee. The final reports, which are approved by the executive committee, and recommendations are published on MCUH’s TAU website, and shared with all Quebec hospitals with more than 100 beds as well as the Quebec Ministry of Health and Social Services. It usually takes 3-4 months to complete the report and the three types of recommendation regarding the HTA-accepted, rejected, and restricted technologies-affect the decision making of the hospital management. Five to six health technologies are assessed each year [14,15]. HB-HTA is well established in Quebec within the network of the five university hospital centers, and is now expanding to the other university medical institutes and affiliated university centers. The mandate of Quebec’s university HB-HTA units involves rigorous evaluations of medical procedures, medical devices, and medical services, and the development of organizational context policy recommendations. The HTA units are linked by various networks that encourage collaboration between researchers at the hospital level. Funding to support HB-HTA activities within Quebec’s healthcare centers has been allocated within institutional operational budgets, with no additional sources available [5,11,13-16]. The University Hospital of Agostino Gemeli in Italy is a representative university hospital that implements HB-HTA and has approximately 1,700 beds. The Health Technology Assessment Unit (HTAU) was established in 2001 as a part of the General Directorate of the hospital, and is supervised by the General Director. Its purpose is to provide evidence to management for decisions regarding resource allocation for specific health technologies via a transparent, fair, and consistent evaluation process. In particular, the HTA takes into account safety, regulatory status, and the financial and organizational impact of the selected technologies. The unit employs multidisciplinary expertise (one clinician, two biomedical engineers, one engineer expert in quality, five health economists, and one statistician) to assess all implications linked to the introduction of specific technologies, with the aim of improving the level of efficiency and effectiveness of the entire system of the hospital and diffusing evidence-based medicine culture [1-3]. The HB-HTA procedure starts with a department’s need for newly developed health technologies that are innovative, high cost, and yet to be implemented in clinical practice. In the second phase, the HTA unit analyzes applications from all interested units (medical department, management and control unit, purchase unit) in order to identify where there is missing information and acquire a comprehensive view. 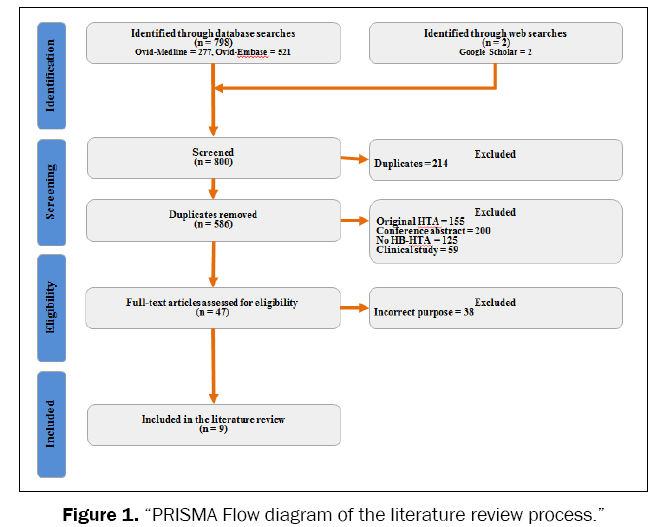 The third phase is the core process, which involves effectiveness analysis based on literature review, regulatory status, and analysis of the organizational and financial impacts, such as direct and indirect costs and the reimbursement system. The fourth phase consists of creating a 2-5 page report [1-3]. All of these processes take about 2 months and are under the control of an internal committee of clinicians, and HTA and public health experts. Apart from the technology assessment, the HTA unit is also involved in R&D, clinical governance, education (training projects organized in collaboration with other countries), and communication. The main training projects that have been realized are the International Master’s Program in Health Technology Assessment and Management: Ulysses Project, and the HTA Distance Learning Course [2-3]. The Hospital Clinic of Barcelona is a day hospital with 839 beds for acute care and 60 beds for long-term care. The HTA unit consists of 2–5 full-time specialists in public health, statistics, and economics, and one administrator who search for articles, with occasional support from the finance department of each clinical institute . The HTA unit conducts HTA through close collaboration between clinicians and the financing team, and produces concerted recommendations with the clinical institute, which then presents the recommendations to the chief executive officer and executive board of the hospital. The role of the HTA unit is to identify proactively and assess reactively health technologies that are to be introduced into the hospital, to advise clinicians and executive directors regarding how to better invest and use resources related to those technologies. The HTA unit also identifies health technologies to disinvest in or appropriate, helps to design clinical studies dealing with innovative health technologies promotes the culture of evaluation in the hospital, and improves national and international HTA networks . The HB-HTA process generally takes 3 months, and in the Hospital Clinic of Barcelona includes diagnostic tests, medical procedures, and medical devices. Through the systematic review, they analyze the patient, financial, and organizational impacts and, occasionally, a mini-HTA is conducted instead of a full HTA. At the final stage, they consider the priority, emergency, value, and risk of the health technologies for policy recommendations . The innovation unit of the Civil Hospital in Lyon was established in 2007, and works in conjunction with other hospital departments for decision making regarding new health technologies. This is the first innovation unit at a hospital in France, and it features an interdisciplinary unit within the medical research clinic and innovation delegation team that consists of pharmacists, biomedical engineers, medical economists, and clinical researchers. The hospital pharmacist role in HB-HTA is particularly important, and clinical and economical assessment is the top priority for them. While the hospital pharmacist role worldwide is generally limited to drugs, at some hospitals in Europe, it includes the supply and management of sterile medical devices. The supply of sterile medical devices in hospitals being within the scope of pharmacists’ authority, according to the law, is distinctive in both France and Italy . The unit supports the clinical research project before the conformity (CE) mark of approval is received and promotes the development of new health technologies through partnership with relevant enterprises. After the CE mark is received, the unit also conducts HTA for new health technologies, including personal medical equipment and medical devices, at the early stage of market access. In this stage, the unit analyzes the economical, ethical, and organizational impacts, rather than the effectiveness of the new health technologies . The Civil Hospital in Lyon also has the Drug and Sterile Medical Devices Committee, which is an internal committee and HTA unit compound model that manages and supervises the HTA unit, which generally implements HTA research, and subsequently makes the decisions . The committee is operated by the innovation unit and implements replenishment work for the medical research clinic and innovation delegation. Their assessment criteria for newly developed health technologies involve the advantage of treatment by the medical device, safety, convenience of use, advantage for staff training, and economic impact . The respondents (N = 46), including 29 health professionals, nine decision makers, seven HTA experts, and one journalist, participated in the interview, either in writing or in person. (Supplementary Table 1) shows the detailed results. Of the 46 interviewees, 54% (25/46) did not know about HB-HTA; however, 93.5% (43/46) recognized the need to introduce this in South Korea. As for the reasons why HB-HTA should be introduced, multiple responses were allowed and the main results were as follows: “Only for research into existing HTA results” (21%, 25/119), “To have a self-operating model for saving funds” (21%, 25/119), and “To co-operate with governmental HTA” (20.2%, 24/119); these comprised more than 60% of the responses. Among the interviewees, 93.5% (43/46) responded that HB-HTA is urgently or moderately needed in South Korea medical institutes. However, some interviewees were skeptical about the introduction of HB-HTA, believing that, at present, government decision making has a powerful impact and that the result of HB-HTA would be inevitably restricted in South Korea. They also argued that if the result of HB-HTA differed from the result of the government’s HTA, this could raise confusion and conflict. From among the 46 interviewees, 43 provided 70 responses (multiple responses were allowed). Regarding the necessary size of the medical institutions, the most common responses were large hospitals, such as general hospitals (34.3%, 24/70), and advanced general hospitals (55.7%, 39/70). Of the 46 interviewees, 36 gave 64 responses (multiple responses were allowed); 37.5% (24/64) respondents deemed medical devices as the most important area for HB-HTA (more so than drugs, health technology, or hospital systems). In addition, most respondents thought that among the medical devices, medical imaging, in vitro diagnostics, and robot surgery were the most needed for HB-HTA, and 34.4% (22/64) noted that health technologies, such as stem cell therapy, robot surgery, and monitored anesthesia care, also needed HB-HTA. Of the 46 interviewees, 44 gave 88 responses (multiple responses were allowed); 44.3% (39/88) respondents said that the impact on patient health should be the most considered element, with the exception of safety and effectiveness of the selected health technologies. Second, 30.7% (27/88) believed that the financial impact to the hospitals should be considered in HB-HTA. Regarding the performance method in the individual medical institutions, 43 experts responded from 46 interviewees, 26 (60.5%, 26/43) of whom responded that HB-HTA organizations should be permanent units in individual medical institutions, and that they should hire a minimum number of experts, researchers, and executive staff as permanent employees as well as, when necessary, temporary researchers to increase work efficiency. However, nine respondents (20.9%, 9/43) believed that HBHTA organizations should be permanent units in individual medical institutions with related experts, researchers, and executive staff all being permanent employees. Regarding the ideal expert composition of HB-HTA organizations in the individual medical institutions, 43 of the 46 interviewees responded and said that at least two healthcare professionals must be included in each HB-HTA organization; further, 65.1% of respondents (28/43) believed that more than one HTA expert must be included in each HB-HTA organization. As to the use of HB-HTA reports, multiple answers were allowed, and 43 of the 46 experts gave 101 responses. Among these, 33.7% (34/101) believed that HB-HTA reports must be used as evidence for nHTA in South Korea, whereas 24.8% (25/101) believed that HB-HTA reports must be shared between related national and public organizations, and used as evidence for health policy making. In addition to the above questions, we requested the interviewees’ opinions regarding the introduction of HB-HTA in South Korea, and found that continuous and phased financial and educational support from related government and HTA agencies was perceived to be necessary. In addition, several respondents said that credible results from HB-HTA must be reflected in national healthcare and reimbursement policies. After analyzing the HB-HTA cases in advanced countries and expert interview results, we developed the following three phased models that reflect the healthcare situation in South Korea. 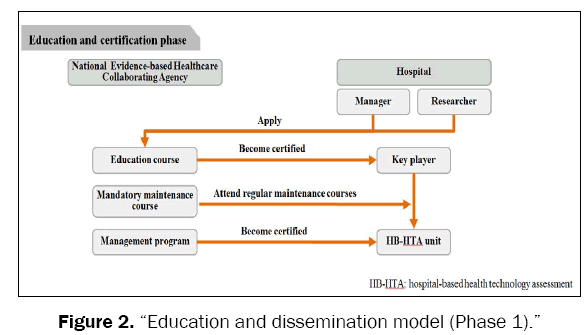 The education and dissemination model applies at the initial stage and involves spreading the HTA concept in hospitals and among healthcare professionals for the stable introduction of HB-HTA in South Korea. The purpose of this model is to train people who are involved in HTA and give them personal certification. As shown in Figure 2, core staff (clinicians, medical researchers, nurses, pharmacists, or statisticians) complete the training course conducted by NECA before establishing an HB-HTA unit in their medical institutes. The first certification consists of two courses, such as systematic review and practice, after which NECA certifies each person individually. The certification is effective for 1 year and then renewed annually through a mandatory maintenance course (Figure 2). 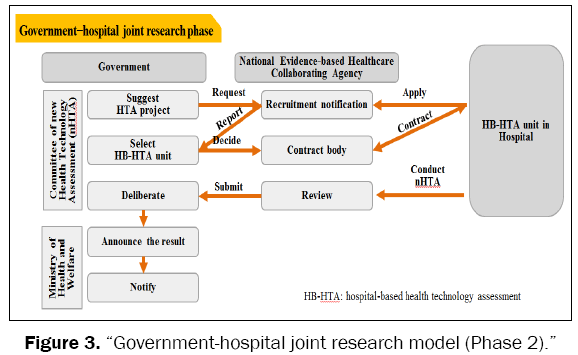 The middle stage is the government–hospital joint research model for collaborating between NECA and hospitals with nHTA. The main purpose of this model is to improve the efficiency and immediacy of the current nHTA system through hospital participation. 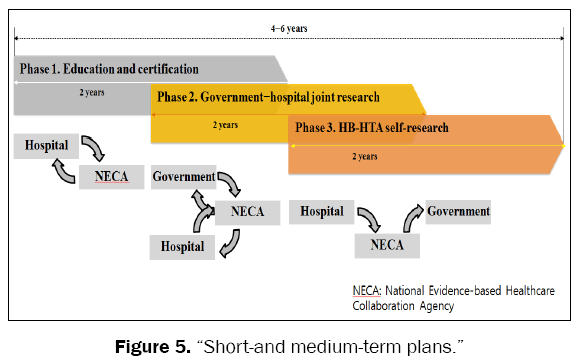 Figure 3 shows the detailed process, wherein the committee for nHTA selects the appropriate hospital and entrusts individual nHTAs to the hospital. NECA then allocates the budget to the selected hospital for the assessment process, and after the individual nHTA is completed, the HB-HTA unit submits the resulting report to the NECA, which NECA then reviews to determine if there is any bias. If there are no problems in the report, the committee for nHTA deliberates on the safety and effectiveness of the new health technology. Subsequently, the Ministry of Health and Welfare will notify the public of the result; however, the HBHTA unit desiring the nHTA obtains organizational certification from NECA before its implementation. NECA determines if the unit is appropriate with the following questions: 1) “Are certified persons included in the unit?”, 2) “Is the unit completely free from conflict of interest?”, and 3) “Are there enough related resources and full time staff allocated in the unit?” After the accreditation, every HTA unit renews its certification annually (Figure 3). 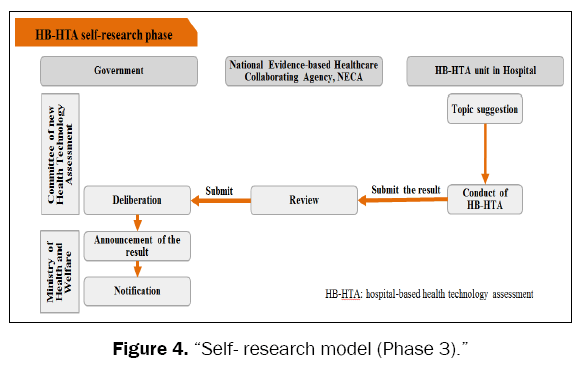 We developed the hospital self-research model for implementation at the stable stage. The purposes of this model are to make effective use of limited financial resources in the hospital itself and to fast track nHTA approval. This model is appropriate for hospitals that have conducted HTA and understood the general concept of HTA through collaborating with the government. There are two target HTA in this model: 1) health technologies that have been used in the clinical field, but have not yet been introduced at the hospital with the HB-HTA unit, and 2) health technologies that are on the non-covered list, and, therefore, require nHTA approval to be used in the clinical field. Figure 4 shows the general process of this model. The HB-HTA unit receives the HTA application from each clinical department and the unit selects a topic for assessment through its prioritization, which is then assessed by staff and the expert committee in the unit. The results include evidence of the safety, cost effectiveness, and organizational and patient impacts of the selected health technologies. Additionally, the final report can be submitted to NECA for verification that the nHTA does not contain any bias or error in the process. Finally, the nHTA committee has 30 days to deliberate on the safety and effectiveness of the submitted health technology (Figure 4). The suggested three models have different purposes and roles, and each stage will take at most 2 years to implement; subsequently, the next stage model can be introduced by reflecting on achievements reached, as shown in Figure 5. The initial stage (education and dissemination model) can be introduced to spread the concept of HTA in hospitals and develop professionals’ capabilities. If this model is operating well within the 2-year period, the middle stage (government–hospital joint research model) can be introduced. The main purpose of this model is to improve the efficiency and immediacy of the current nHTA system through hospital participation. We believe that this stage will allow hospitals to accumulate HTA experience, thus ensuring internal stability. The last stage model (self-research model) corresponds well with the HB-HTA model, which is already operating in a number of advanced countries. As Figure 5 shows, if each stage is accomplished in a short period, the next stage can be introduced earlier than the 2-year estimate; thus, within 4–6 years, the HB-HTA can be established in South Korea. Moreover, the personal certification and organizational certification processes in the proposed frameworks will allow hospitals to establish confidence and improve transparency, and will increase hospitals’ level of awareness regarding HTA (Figure 5). Second, collaboration between government and hospitals will reduce the time taken to introduce new health technologies in the domestic clinical field. The current nHTA process takes 280 days from the application date, medicinal product or medical device suppliers must acquire item authorization from the Ministry of Food and Drug Safety. For this reason, the period of introducing new health technologies takes a long time . If each hospital’s HB-HTA unit completes the nHTA and NECA then only verifies the final report, the whole process could be completed within 3-4 months. Third, the hospital self-research model could solve hospital financial issues, which is the main purpose of a general HB-HTA. If the hospital implements HTA for new technology that is not introduced in the current insurance system, the hospital will not only acquire evidence of the safety, performance, cost effectiveness, and financial impacts but also can make decisions more quickly than other medical institutes regarding the introduction of specific health technologies. However, there will be barriers and limitations to the introduction of HB-HTA in South Korea for the following reasons: First, general hospitals find it easy to introduce HB-HTA onsite using their abundant resources, such as labor, facilities, and budgets; however, small-scale hospitals may have difficulty with introducing HB-HTA due to limited resources. Second, the expert interviews show that because centralized decision making is still common, conflicts between the HB-HTA and the government’s HTA will lead to a state of confusion. To overcome these limitations, amicable cooperation and continual communication between government and HB-HTA medical institutes is needed. Finally, for the stable establishment of HB-HTA in South Korea, cooperation system of hospital and government, strengthen public relation of HB HTA and budget support are needed. This study is the first to attempt to develop frameworks for HB-HTA in South Korea. For this purpose, we explored in detail the opinions of relevant policy makers, healthcare professionals, and HTA experts with regard to the introduction of HB-HTA in this country, and created frameworks by reflecting on the South Korean condition. Introduction of the suggested frameworks will allow for efficient resource allocation and the provision of safe, effective, and cost-effective health technologies to patients in South Korea. In the long run, these frameworks will be a foundation for implementing transparent HTA by reflecting realworld conditions at the national level. Moreover, these frameworks will contribute not only to preparing a firm foundation for safe patient care but also to the effective use of national health insurance finance and national healthcare expenditure. Martelli NL, et al. Hospital-based health technology assessment for innovative medical devices in university hospitals and the role of hospital pharmacists: learning from international experience. Intl J Tech Assess in Health Care. 2013;29:185–191. Catananti C, et al. Hospital-based health technology assessment: the experience of AgostinoGemelli University Hospital’s HTA Unit. Italian J Public Health. 2005;2:23–28. Marchetti M. HTA in Italy from a national perspective to hospital based HTA. Presented at the Intl Conference on Applied Health Econo and Math, Koper, May 2–4, 2010. Juzwishin D, et al. Hospital-based technology assessment programmes: two Canadian examples. World Hospitals and Health Services: Official J Intl Hosp Fed. 1996;32:2–9. McGregor M and Brophy JM. End-user involvement in health technology assessment (HTA) development: A way to increase impact. Intl J Tech Assess in Health Care. 2005;21:263–267. Attieh R and Gagnon MP. Implementation of local/hospital-based health technology assessment initiatives in low- and middle-income countries. Intl J Tech Assess in Health Care. 2012;28:445–451. Mitchell MD, et al. Integrating local data into hospital-based healthcare technology assessment: two case studies. Intl J Tech Assess in Health Care. 2010;26:294–300. Kidholm K, et al. Assessment of the quality of mini-HTA. Intl J Tech Assess in Health Care. 2009;25:42–48. Gagnon MP, et al. Introducing the patient’s perspective in hospital health technology assessment (HTA): the views of HTA producers, hospital managers and patients. Health Expec. 2014;17:888–900. Martelli N, et al. Hospital-based health technology assessment in France: how to proceed to evaluate innovative medical devices. Annales Pharm Franc. 2014;72:3–14. Hospital Health Technology Assessment: the Hospital Clinic Barcelona approach. Panel on Hospital-HTA, 8th HTAi Annual Meeting, 26–20 Jun, 2011.